Chubby Soul has been on vacation! I was in Brazil for nearly three weeks, then came back to Lisbon for a whirlwind visit before lugging all of my stuff off to London. I have a list of Brazilian recipes that I’m dying to try, and I also just moved to a place where they have ingredients that I’d been desperately missing while in Portugal (hello, jalapeños!) so I’m sure I’ll be back in the swing of things before too long. I cooked exactly twice while on vacation in Brazil. The first time, I made pancakes because I’m American and it was just expected. The second time, I was supposed to bring a dessert to a family Christmas party. My original plan was to make a cheesecake, but I didn’t have the right pan or the right ingredients. 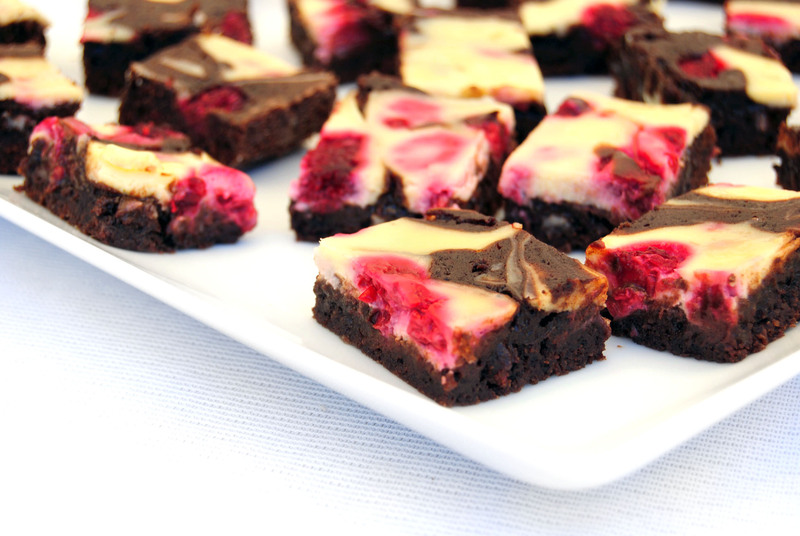 I would say that these brownies were the next best thing, but I actually think that they were simply the best thing. In any case, they’re much easier than a cheesecake and quicker, too! They also happen to be delicious, and damn good-lookin’, if I do say so myself. I served them cut into teeny tiny miniature brownie squares, which everyone loved, but I’m sure nobody would complain if you served XXXL raspberry cheesecake brownies. They’ll probably love you for it. I know that everyone has their own idea about what makes a perfect brownie, so the good news is that this recipe is adaptable to fit even the pickiest brownie palate ! You can use your favorite brownie recipe for the base, or even a box mix if you must. The brownie recipe I used yields a moderately gooey fudge-like brownie, so if you prefer a cake-like brownie, use another recipe for the base. The cheesecake topping will work either way! Preheat the oven to 350ºF/175ºC. Butter and flour an 8-inch square pan. In a medium saucepan, melt butter. Remove from heat. Stir in sugar, eggs and vanilla. Mix in cocoa, flour, salt and baking powder. Spread batter into pan. In a medium bowl, beat together cream cheese, egg and sugar until smooth. Gently fold in raspberries without overmixing. 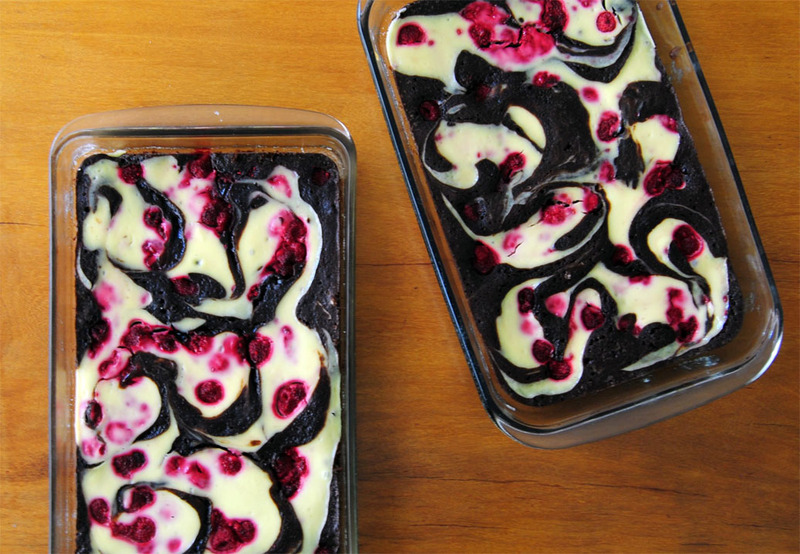 Spoon the mixture on top of the brownie batter and use a knife to create a swirl pattern. Oh my…to heck with the New Year’s resolutions! Wowwww I ll try this soon!